Alcohol and low carb simply don’t mix, right? Not so fast. As Todd White, founder of Dry Farm Wines explains, it depends on the product. 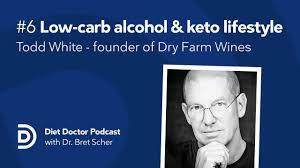 If a zero sugar, low carb, no additive product sounds too good to be true, then you have to listen to this podcast. But Todd isn’t only a wine expert, he is also a self-described biohacker. Through the years Todd has become an expert on maintaining a keto lifestyle, prioritizing exercise and maintaining a regular meditative practice despite his rigorous international travel schedule. He lives his life with integrity and healthy principles, and promotes these concepts as a main focus of his business culture. I was amazed to hear they start each work day with an hour-long group meditation. That is a company culture I can support! Todd's knowledge base goes well beyond alcohol, and he provides essential pearls we can all learn from. My understanding is that spirits are the best choice for alcohol for the Keto lifestyle. I should have asked for greater clarification on that point as it is at odds with other resources. Thanks for pointing that out! Great interview with someone with a rare combination of Keto lifestyle & meditation culture in his workplace. I think you are being hard on yourself (intro remarks), I found the podcast balanced and very informative with some helpful tips, it is almost impossible not to interview somene who is associated with a product or an organisation. Previous Previous post: Low Carb and Intermittent Fasting Make Traveling a Breeze! Next Next post: Does Eating Fat Make Us Fat?